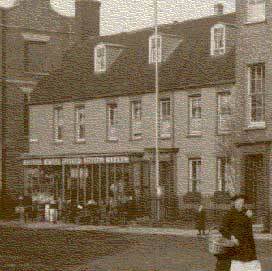 Thomas Shuckford Denny, Grocer, Draper, Wine Retailer and General Store ( C1891, K1896). 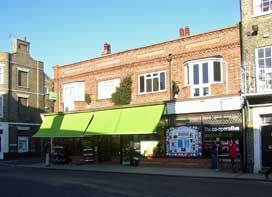 Thomas is married to Ellen and they live with their 8 children and two servants over the shop.Teenage son, Thomas (Jnr) works as a grocery assistant and daughter, Deborah as a drapery assistant. 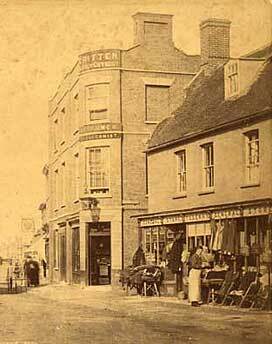 Thomas Shuckford Denny, Grocer, Draper, Wine Retailer and General Store. (C 1911) Thomas and Ellen are now in their mid 60s. Only two of their children are now living with them: Martha is the company book keeper and Victoria is Assistant Housekeeper. There is now only one live-in servant. Thomas Shuckford Denny dies this year aged 74. 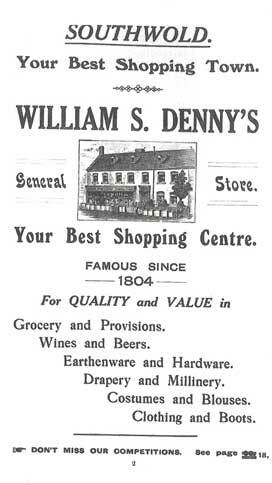 The store appears to continue to trade under the 'Thos S Denny' banner although his son and successor, William S Denny also uses his own name in advertising, as indeed he has since 1907. See advertisements, right. (clarification required). 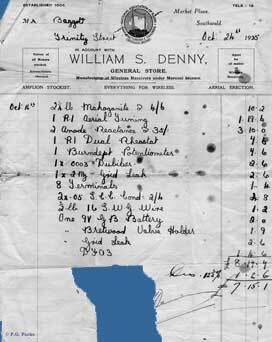 Sydney S Denny, the son of William S Denny, is now the owner. 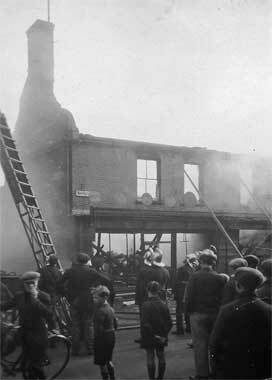 On 3rd April 1930 the store is destroyed by fire. 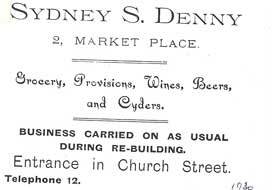 The store has been rebuilt and is now trading as Denny & Jones, Grocer and Confectioner, Wines, Beers & Cyders. (K 1933). 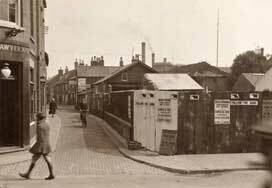 Sydney has married Miss C M Jones who runs a high-class confectionery business at No 54 High Street. Sydney is determined to create a very special store comparable to a West End emporium. His shop front, his Ford delivery vehicle and its driver sport the fashionable new Denny & Jones ivery. There is now a restaurant on the first floor. Denny & Jones (SRB) This year Sydney incorporates the Jones business into his own store as a 'shop-within-a-shop'. Sydney Is also reputed to have an interest in Southwold Pier. More informaton sought on this. 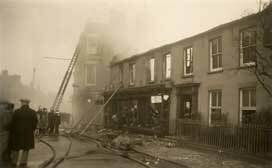 No2 Market Place was rebuilt in the 1930s after being burned down. 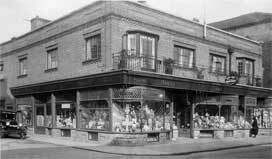 It now houses the Co-op. 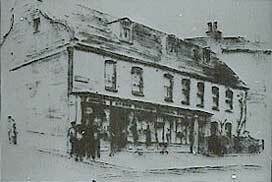 A sketch of the Denny store - perhaps for use in advertising - probably around 1900. From a slide in the Southwold Museum collection. 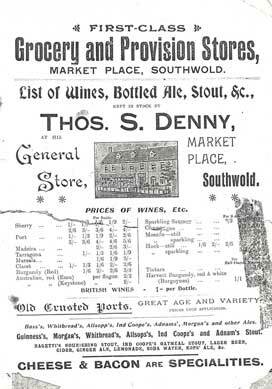 Advertisement in a Southwold Tourist Guide 1905. Above: Thomas Shuckford Denny advertised an impressive list of international wines in 1907, including Italan Marsala, Spanish Tarragona and Madeira at between 1/- and 1/6 a bottle (5p to 8p in today's money) and even Australian wine at 2/2 (about 11p) per flagon. 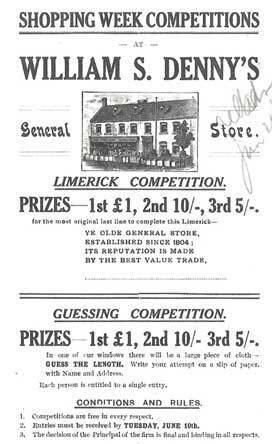 Click the advert to enlarge. A Thomas S Denny advertisement from 1915.
in the 1920s William S Denny had a whole department dedicated to the new technology of radio. For permission to reproduce this invoice to Mr A G Baggott, the 'early adopter' butcher of No 11 Trinity Street, we have to thank the latter's great grandson, Peter Parke whose copyright this is. 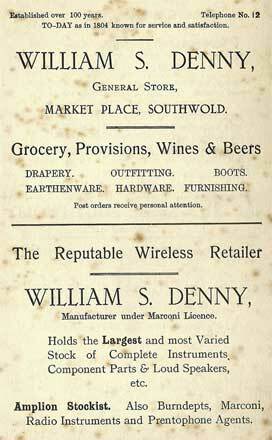 1929 advertisement for W S Denny's Wireless Department. 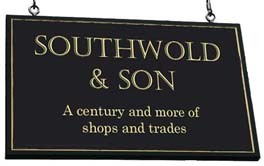 Southwold Wesleyan Church Guide. Both above courtesy of Heather Osmer. 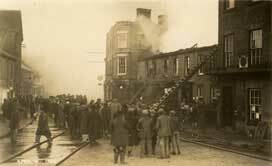 Denny's store ablaze in 1930. The new Denny & Jones Store after rebuilding in fashionable Art Deco style. 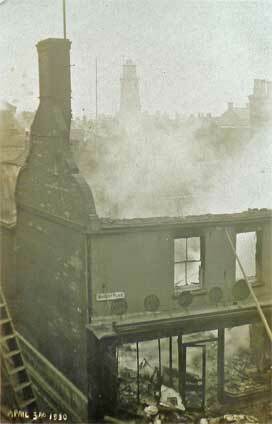 The stor even boasted a restaurant upstairs. 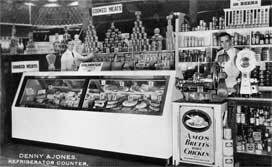 The refrigerated counter - an innovation in the new Denny & Jones store. 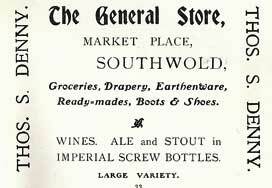 1946 advert reproduced from the Souvenir Programme for the Southwold Victory Celebrations.